Our men’s soccer team will play in the semi-finals of the national tournament for the first time in 20 years – the year we won the national title. Friday’s kickoff against Lindsey Wilson is slated for 12:00 pm. A live video broadcast of the game will be shown in Barber Auditorium on Belhaven’s campus. Fans can also follow along with live stats, courtesy of Dakstats and the NAIA, and access the NAIA National Championship Tournament page by clicking here. If they win, they will play in the national championship game on Saturday at 3pm. MONTGOMERY, Ala.- The Belhaven men’s soccer team punched its ticket to the 2012 NAIA National Championship Semifinals on Wednesday with 3-2 come from behind victory over Hannibal-LaGrange University. This year’s appearance with be the third trip to the semifinal round in the history of the program. The Blazers first semifinal appearance came in 1982 and the most recent up until this season was the national championship campaign of 1992. Victor Lawrence scored two goals and Victor France added the game winner in the final three minutes to deliver the win and setup up Friday’s showdown with Lindsey Wilson. France’s game winning goal came on a free kick following a critical foul by Hannibal-LaGrange. France made a perfect kick into the top-shelf on the left side of the net for what would prove to be the game winner in the 87th minute. To get to Hannibal-LaGrange, the Blazers had to navigate matches against two other tough opponents. Belhaven topped Tennessee Wesleyan 5-0 in the opening round and then upset previously unbeaten University of Science and Arts (OK) 2-1. The Blazers will now face top-seed and defending NAIA National Champion Lindsey Wilson. The Belhaven Singing Christmas Tree celebrates its 80th year this weekend with traditional song and a reunion bonus. To celebrate the milestone, a special Reunion Choir of past Belhaven Christmas tree singers will join students for the performances Friday and Saturday in the Belhaven University Athletic Bowl. The popular event began in 1933 and is considered the country’s oldest outdoor singing Christmas tree event. “We thought it would be fun to have people from the previous years to come and join with the existing soloists and singers from the current generation of students,” said Christopher Shelt, professor of voice, church music and choral activities at Belhaven University. Response has been good, he said, with activity stepping up as the event nears. Some who have reached their own eighth decade are planning to join in. This year’s Singing Christmas Tree could be as many as 170 voices strong, with dozens in the Reunion Choir joining 140 or so students, plus faculty and staff. “There are a few musical enhancements, but it’s just an opportunity to get together people from years past — kind of the more the merrier,” Shelt said. 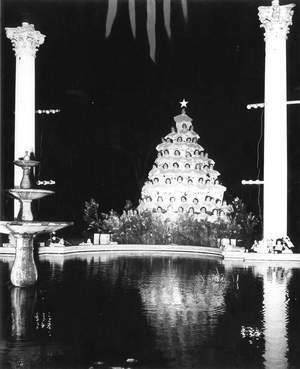 Bettye Quinn, associate professor of education at Belhaven, remembers the tree from age 3 in 1937, with its 50 white-robed girls holding lights that reflected in the lagoon. “It was just a glorious sight for a little girl to see,” Quinn is quoted in a news release. She’s come back every year since. This year brings a voice boost. That joins the visual boost the tree got last year — computerized lighting with programmed cues for patterns and sequences with the carols. If they hang on to win, we’ll play in the semi-finals on Friday! Our men’s soccer team won today 2-1, and now moves on to the quarter finals in the national tournament. We play tomorrow at 11 am against Hannibal-LaGrange College who have pulled off two upsets in the first two rounds of the tournament – they defeated 13th seed Missouri Valley 1-0 in the opening round and toppled 4th seed Rio Grande 2-1 in double overtime on Monday. Belhaven was seeded 12th in the tournament. You can follow live game stats HERE at 11am tomorrow. 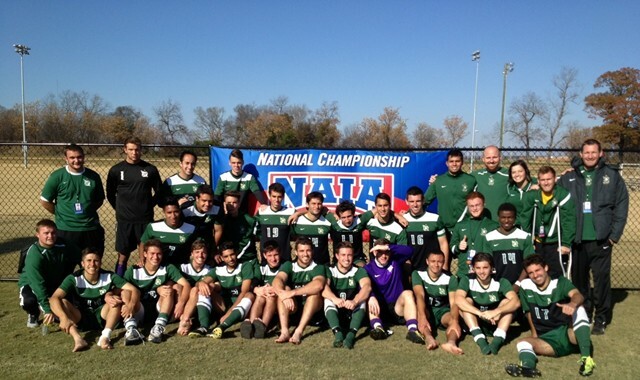 This week our Men’s soccer team takes their 15-4-1 record into the national tournament. This will be our third consecutive year to advance to the national tournament round of 16. Playing at home a week ago, we won the opening round 5-0 victory over Tennessee Wesleyan. The four final rounds of the national tournament begin tomorrow in Montgomery, Alabama. TUESDAY – we play The University of Science and Arts of Oklahoma at 11am. Our web site will have details about how to follow the game or watch it. WEDNESDAY – if we advance to the quarter finals we will play Wednesday at 11am against either Rio Grande University (Ohio) or Hanible-LaGrange University (Missouri). FRIDAY and SATURDAY – the Semifinals will be played Friday at noon, and the national championship game will be played Saturday at 3 pm. This team has had a remarkable season, and we are proud of them playing at the highest levels with the best teams in the nation. Congratulations to head coach, Brian McMahon, and this talented team. We have begun filming a video history of Belhaven University, and no one better to film for the first installment than Bettye Quinn. This 7 1/2 minute video is part one of three parts. I’ll post the other segments soon. The Belhaven’s men’s soccer team plays a NAIA National Championship Opening Round matchup against Tennessee Wesleyan at 1 pm Saturday afternoon at H.T. Newell Field. The Blazers are hosting an opening round game for the third year in a row, having won opening round games in 2010 (St. Thomas) and 2011 (Texas-Brownsville) to move to the round of 16. All the details you can find HERE including a link to watch the game. To start the Christmas season off with a celebration, students and faculty from Belhaven’s Choral and Vocal Arts will present the Handel’s timeless classic, Messiah, at Belhaven’s Center for the Arts Concert Hall, located at 835 Riverside Drive. There will be two opportunities to enjoy this classic performance: Saturday, November 17, 2:30 p.m. and Sunday, December 2, 2:30 p.m. The Fall Dance Concert has earned the reputation of being one of the most highly anticipated dance performances at Belhaven University and this year will showcase the choreography of dance faculty and guest artists from the Belhaven University Dance Ensemble. The Concert we have a variety of offerings spanning dance history beginning with ‘Water Study’ choreographed by Doris Humphrey in 1928, George Balanchine’s classic ‘Serenade’ beautifully constructed in 1935, Laura Morton’s ‘For Your Dancin’ Pleasure’ set in 1940 war times to familiar big band tunes.” The final performance will be Saturday in the Bitsy Irby Visual Arts and Dance Center at 7:30 p.m.
Sabrina Morgan, a 1st grade teacher, who earned her MED from Belhaven in 2007 has been recognized by the Milken Foundation as one of only 40 outstanding teachers in America. She was suprised by the Foundation during an assembly at her school, and WLBT cameras where there for the presentation. The Milken Foundation awarded Sabrina Morgan of Pearl Lower Elementary School the Milken Educator Award in a surprise ceremony Tuesday morning. Recipients of the Milken Educator Award do not know they have been nominated for the award until they are presented with it. The foundation selects up to 40 teachers per year to receive awards; winners receive a $25,000 cash prize. Morgan is a first-grade teacher who has been with the Pearl school district for 11 years. Last year she organized a reading drive called Hooked on Books aimed at getting Pearl Lower Elementary’s 702 students to read 10,000 books between the end of spring break and the end of the school year. Students met the challenge in less than four weeks. Morgan uses Skype to allow sick students to participate in class so they don’t miss out on class time. She also organizes math- and science-night events for students and keeps parents informed of class activities with a weekly newsletter. Ninety-six percent of Morgan’s students improved in reading, and 100 percent improved in math in the 2011-12 school year, according to a state assessment. Morgan helps produce and revise curriculum maps and pacing guides, and she mentors beginning teachers. She chairs Pearl Lower Elementary’s language-arts team and math team. She also supports juvenile diabetes awareness campaigns and organizes a districtwide canned food drive. The Milken Foundation has been giving out Educator Awards for 26 years. The award was first presented to a dozen California teachers. More than 2,500 K-12 teachers, principals and specialists have received Milken Educator Awards, adding up to $63 million in total cash prizes so far. 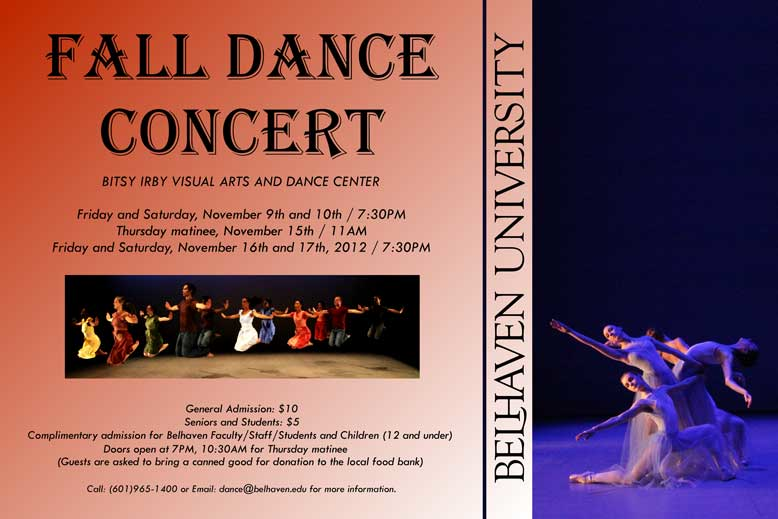 For Belhaven University’s Fall 2012 Dance Concert we have a variety of offerings spanning dance history beginning with “Water Study” choreographed by Doris Humphrey in 1928, George Balanchine’s classic “Serenade” beautifully constructed in 1935, Laura Morton’s “For Your Dancin’ Pleasure” is set 1940 war times to familiar big band tunes and “Songs of the Disinherited” created in 1973 by Donald McKayle celebrating the Black Dispora in the New World. Two newly constructed works by Ryan Corriston and Caleb Mitchell offer balance to the program bringing perspective to contemporary topics and experiences that we can consider through a Christian Worldview. Our Football Blazers play at home tomorrow night versus #18 Bethel University for a Western Division Mid-South Conference Championship, as well as the possibility of our first ever national playoff berth!! What a huge opportunity – we need to pack the stands for a Green Out (wear as much green as you can find) and help our guys clinch the first outright division title in program history. The winner of the game automatically secures the Western Division crown, and we also have a shot at a national playoff berth if we finish in the top 20 of the next national ranking. While we don’t control the rankings, everything else is in our hands, so do your part by coming out, bringing friends, cheering loud and encouraging our guys. Kickoff is at 6:00 pm and gates open at 4:00 pm. Ours is a talented, exciting team playing a quality opponent and you’ll want to be part of this historic night at Newell Field. Also playing at home this weekend are our Men’s and Women’s Basketball squads, beginning tonight with match ups against crosstown rival Tougaloo College. The Women tipoff at 6:00 pm followed by the Men at 8:00 pm. The Women play again tomorrow versus Harris Stowe State at 1:00 pm in Rugg Arena. Join me in congratulating our Volleyball team for setting a school record with their 26th win of the season, set yesterday versus Coastal Georgia at the SSAC Conference Championships in Montgomery, AL. The ladies have a second pool match today at 12:30 pm versus Southern Wesleyan, and then await their final seeding for bracket play as they reach for a SSAC Championship. Well done.